On a hot Saturday in June, Alise Sjostrom and her family hosted nearly 800 people on their farm outside Brooten, Minnesota, a town of only 743. They all came to sample the cheddar cheese curds she makes fresh on the farm. The day of Curd Fest 2018 was half a lifetime in the making for Alise, now 32 years old. She started fantasizing about making cheese on her family’s farm when she was 16. From dream to thought-out reality. Determined to become a farmstead cheesemaker, Alise studied food marketing through a specially designed curriculum at the University of Minnesota, and then learned the craft at the Vermont Institute of Artisan Cheese. “I didn’t come back home immediately. I worked for cheese companies in Vermont and Wisconsin first. I was able to determine exactly what I wanted my cheese plant to be by working in those,” says Alise. In 2012, with her husband, Lucas, and 3-week-old daughter, Lucy, she moved back home. They launched a Kickstarter campaign and received loans from their credit union and electric association to start Redhead Creamery. “My three sisters and I are known for our red hair, and I hope to eventually make more than just cheese, maybe butter. So, Redhead Creamery is the perfect name,” says Alise. Alise drew up the plans herself, and used the loans and crowd-sourced funding to build a cheese plant next to their barns and install an underground pipeline connecting it to the parlor. Once fully online in late 2014, Alise has been using 7–10% of the farm’s milk to make at least 1,000 lbs. of cheese weekly. The rest of the farm’s milk goes to a Minnesota co-op. In 2015, she received a USDA value-added producer grant to help add staff and cover other capital expenses. Consumer trends. The realization of Alise’s plan is mostly due to her determination and hard work, but it’s also due to having the right idea at the right time. 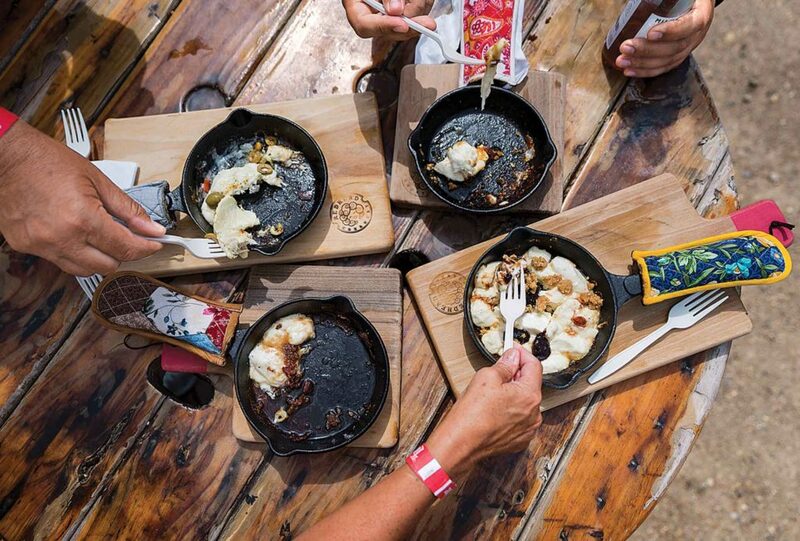 Hot and gooey pan-fried cheese curds with sweet or savory toppings were the most popular item at Curd Fest. According to USDA Economic Research Service data, American consumption of cheese has increased more than 25% since Alise first thought of making cheese. And according to the Canadian Dairy Information Centre, the U.S. market still has growth potential. U.S. consumption trails that of some European countries by almost half. More specifically, the small batch and artisan cheese category is growing at a fast pace in the U.S. For example, membership in the American Cheese Society (the organization for those making craft cheese) has nearly doubled in the past 15 years. Making it pencil out. Building a successful farmstead cheese company is not only a dream come true for Alise, it is a much-needed additional revenue stream for Jer-Lindy Farms, named after her parents Jerry and Linda Jennissen. It gives potential to support the next generation of family on the farm without having to add more cows. “The business model for dairy farming is changing fast, and we knew we would need to do things differently. We worked with our lender to create a place where we could make products with a taste people have never experienced before,” says Alise. She designed the creamery to have an agritourism element as well as cheese sales. The cheese plant itself has two levels. 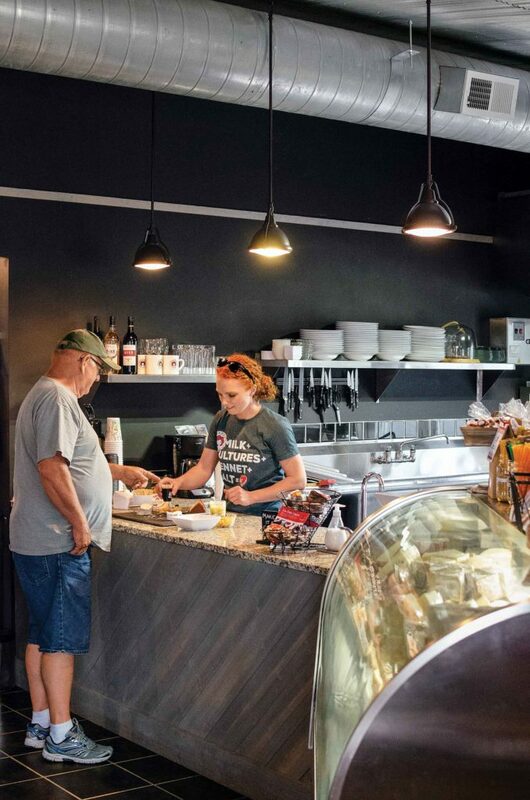 The production room and cheese caves are in the basement, and the main floor has a commercial kitchen, tasting room, and shop for customers to sample and buy fresh cheese and other Minnesota-made food and goods. Visitors can even enjoy a drink while asking questions about the farm. Alise offers tastes to visitors in her cheese shop. Having 800 people on the farm in one day is not the norm, but they do welcome an average of 400 people monthly. They host smaller events regularly and partner with area vendors and organizations to draw in a steady stream of visitors. Those who make the trip to the creamery can tour the 200-cow dairy barns for $10 each. Online reviews show this is a highlight. “The ability for people to see a working farm—and in many cases, how it’s changed from the images of the past—may be our most important contribution as a business,” says Jerry Jennissen, Alise’s father and manager of the dairy farm.